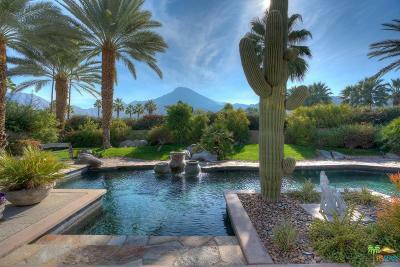 Distinctive southwest contemporary home on a lushly landscaped lot. This beautifully built home captures the true mystery and appeal of the Colorado desert. Located off the fairway and completely walled for privacy this 6045 sq ft. floor plan is perfect for family and entertaining. Main house has 3 bedrooms with en-suite baths. Huge kitchen with island, 6 burner gas cook top, premier appliances and light wood cabinetry. Eat-in kitchen and family room with cozy fireplace leads onto an enchanting outdoor kitchen and dining area in a southwest territorial design complete with outdoor fireplace and log pole beam trellis. Main living/dining great room with walls of glass opening to bring the resort style backyard into the main living areas. Crystal clear pool/spa w/ vessel waterfall & blooming desert plants. Detached guest casita has 3 separate bedroom suites and 3 baths; each with it's own entrance. Garage is air conditioned and accommodates 2 cars and 2 golf carts.